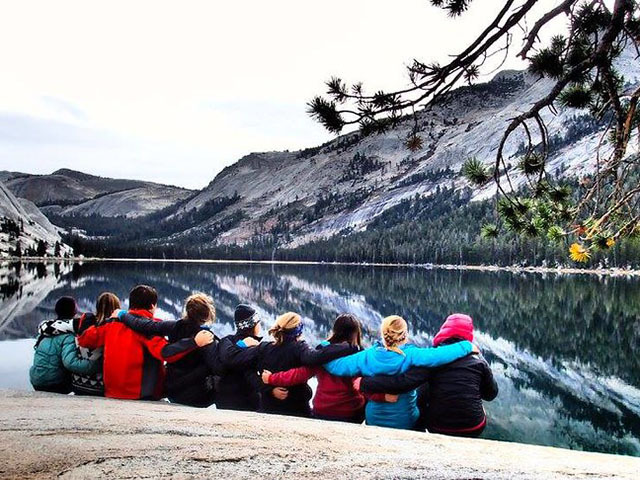 Experience some beautiful backpacking in the Sierra Nevada Mountains! The challenges of traveling by foot and living out of a backpack are rewarded by pristine alpine lakes, rugged peaks and a shared sense of accomplishment. We will travel 4-10 miles per day at elevations above 8,000 feet. While this trip will be challenging, no previous experience is necessary. Backpacking is as simple as walking in the woods, but carrying a loaded pack in the mountains over uneven terrain is physically strenuous. We will travel between 4 and 10 miles per day with packs loaded with personal equipment, water and a share of the group gear and food. The sense of accomplishment from backpacking is probably greater than any other trip we offer and many first time backpackers have had very positive experiences on this trip. Check in at the Outdoor Adventures office before early move-in. Meet your small group and familiarize yourself with USD’s campus. Review clothing and make final preparations before we depart. We will spend our first night camping en route to the mountains. Today we will finish our drive to the trailhead, finish packing our packs and prepare for the adventure ahead. This will be our first night sleeping in the backcountry. Wake up to the warm sun and continue hiking past glacial lakes. We will enjoy lunch near an alpine lake as we get to know our group better. Enjoy some time relaxing on sun-warmed granite before dinner. Another night falling asleep under the stars. We’ll continue our hike past alpine meadows, wild flowers and lodge pole pines. By now, we’re accustomed to our beautiful alpine surroundings and have made the backcountry our home. Today we'll hike to our final campsite and enjoy one last night next to a beautiful lake. After an early morning hike to the trailhead, we'll load out gear back into vans for our return drive to San Diego. We plan to return to campus around 10pm.